Deborah H. Atkin, M.D. offers patients of her San Diego practice the recently approved JUVÉDERM VOLUMA XC to temporarily improve signs of aging in the cheeks. 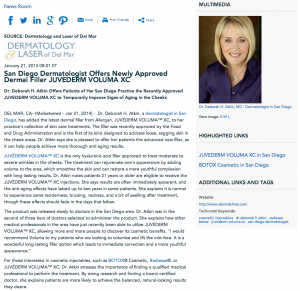 Del Mar, CA – Deborah H. Atkin, M.D., a dermatologist in San Diego, has added the latest dermal filler from Allergan, JUVÉDERM VOLUMA™ XC, to her practice’s collection of skin care treatments. The filler was recently approved by the Food and Drug Administration and is the first of its kind designed to address loose, sagging skin in the cheek areas. Dr. Atkin says she is pleased to offer her patients this advanced new filler, as it can help people achieve more thorough anti-aging results. JUVÉDERM VOLUMA™ XC is the only hyaluronic acid filler approved to treat moderate to severe wrinkles in the cheeks. The treatment can rejuvenate one’s appearance by adding volume to the area, which smoothes the skin and can restore a more youthful complexion with long-lasting results. 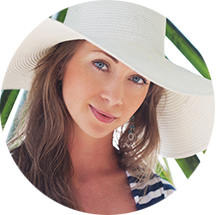 Dr. Atkin notes patients 21 years or older are eligible to receive the JUVÉDERM VOLUMA™ XC injections. She says results are often immediately apparent, and the anti-aging effects have lasted up to two years in some patients. She explains it is normal to experience some tenderness, bruising, redness, and a bit of swelling after treatment, though these effects should fade in the days that follow. For those interested in cosmetic injectables, such as BOTOX® Cosmetic, Radiesse®, or JUVÉDERM VOLUMA™ XC, Dr. Atkin stresses the importance of finding a qualified medical professional to perform the treatment. By doing research and finding a board-certified doctor, she explains patients are more likely to achieve the balanced, natural-looking results they desire. Deborah H. Atkin, M.D. is certified by the American Board of Dermatology. She received specialty training in dermatology at the University of Arizona, Tucson and completed medical school training at UCLA. Dr. Atkin volunteers her time with the American Cancer Society and the American Liver Foundation. She has also been asked to be a volunteer attending physician at both UCSD and the San Diego Veteran’s Administration Hospital. 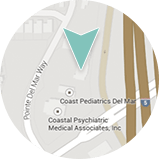 In addition to her dermatology practice and volunteer work, Dr. Atkin is a member of a number of professional organizations such as the California Academy of Cosmetic Surgery, the San Diego Dermatological Society, and the American Society for Dermatologic Surgery. She is available for interview upon request. please visit dermdelmar.com or facebook.com/dermdelmar. Dr. Deborah H. Atkin, M.D.